Our V3 Appliances are pre-tuned to provide just the right amount of CPU, RAM and GPU for each type of worker. This means, your business no longer needs to be held hostage to the tech specifications of virtual desktop infrastructure (VDI) solutions from alternative, inflexible VDI vendors. To get a better sense of your requirements, see what workforce group your organization fits into below. Knowledge Workers are typically white collar professionals. They use a low amount of CPU and RAM and require relatively small amounts of GPU from time to time. Their most commonly-used desktop applications are productivity related and also include browsers. Examples include accountants, administrators, teachers, developers and programmers in academia, call center workers, general office workers, pharmacists and bank tellers. 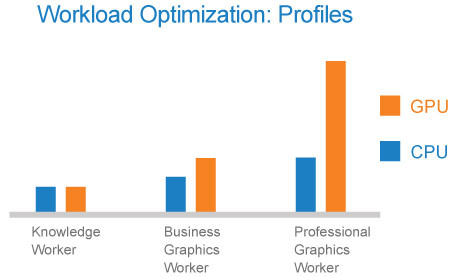 Business Graphics Workers use static images, short videos or need to compile code. They use more CPU and RAM and require large amounts of GPU, almost all the time, for their mission-critical applications. Examples include architects, brokers, chemists, dentists, developers, doctors, nurses and programmers. Professional Graphics Workers create high definition static images, or long videos, 3D videos, animation and often compile large amounts of code. They require practically dedicated GPU resources for their workloads. Examples include animators, chemical modeling engineers, desktop publishers, geospatial application users, radiologists and X-Ray technicians.